This week, my Glyph du Jour is one that does NOT exist in Unicode. It's a capital Q with a dot above representing "heat transfer per unit time" (or rate of heat transfer). Similar thermodynamic symbols are Ẇ (rate of work produced) and ṁ (rate of mass transfer)...and interestingly these DO exist in Unicode. Why W-dot and m-dot, but no Q-dot? It's because these particular symbols probably have a use somewhere beyond thermodynamics. For instance, ṁ was sometimes used in older Classical Irish spelling (today's mh). Therefore the community was able to lobby for the inclusion of this letter within Unicode in order to transcribe historic Classical Irish texts (lucky for my thermodynamics course). The irony here is that within Unicode Classical Irish actually has better resources than the engineering community (or the statistics community which could use p-hat or p̂). I don't think it's an evil conspiracy, but the fact that many engineers probably think of their notation quirks as a "font/layout" issue rather than as a "foreign language" issue. The next step could be that someone proposes the inclusion of Q-dot or Q̇ (and its sibling q-dot or q̇ which is rate of heat transfer per unit mass. This could raise the issue of whether we can get with just combining Q plus a "combining diacritic" dot - that is a manually combining a letter and a diacritic. Based on what I've seen, I would say no. First, few everyday fonts support "combining accents" well. They would much rather work with precomposed characters with accents built in. partly because it is difficult to place a dot consistently for each letter without building it ahead. I can fudge a q̇, but if I try Q̇, the dot often disappears into the taller capital Q. At best I'm stuck with Q ̇ (Q with upper-right dot). Another lesson that someone WILL always find some new combination of the Latin alphabet to mess around with. Below is a table showing a test of the combining dot for the Q-dots and the existing dotted letters. As you can see, there are only a few dotted letters missing. 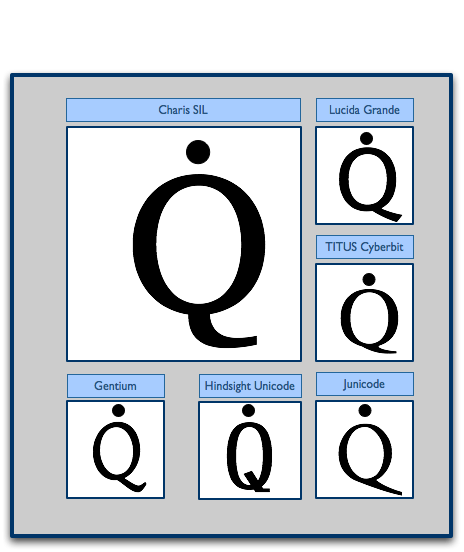 Note: Q-dots best viewed with Arial Unicode MS, Gentium or other specialized Unicode font. As of November 3, 2008, both the ISO-639 language code mo (Moldovan) and the ISO-639-2 code mol (Moldovan) were deprecated in favor of Romanian. In other words, the encoding standards authorities have embodied the notion that Moldovan, as spoken in the Republic of Moldavia, is actually so closely related to Romanian that they are both dialects of each other. This has been the stance claimed by the linguistic community and many elements in both the Romanian and Moldovan community. From now on, the code ro (Romanian) will refer to the language forms used in both the countries of Romania and Moldova. The tags to distinguish linguistic forms in Romania from that of Moldova will be ro-RO (Romanian or Romania) and ro-MD (Romania of Moldavia). This may seem to be a trivial change, but it's heartening from my point of view. In recent years, there had been a trend in language code assignments to favor political expedience over linguistic reality. The most similar case was the elimination of the sh for Serbo-Croatian, as spoken in the former Yugoslavia in favor of three "separate" language codes for Serbian ( sr ), Croatian ( hr ) and Bosnian ( bs ). Although there are genuine regional differences between the forms (especially for Croatian), linguists still debate whether these forms are separate languages or dialects. Although I do not expect the three codes for Serbian, Croatian and Bosnian to be eliminated anytime soon, I do think it's a good sign that speakers in Moldova and Romania were willing to re-evaluate their linguistic identity. Codes for language varieties are constantly being updated, but here is a list of some important changes that have happened in recent months. Note that here the assumption is that zh is Mandarin Chinese. From the discussion it appears that more precise codes for Mandarin could not be used because they had not been fully-approved (sigh). If you are working with a "dialect", you may need to include an appropriate dialect/language extension. Valencian (Spain) is considered to be a regional dialect of Catalan or code ca-valencia. The code be-1959acad is for "Academic (govermental) variant of Belarusian as codified in 1959.